Giving creative business owners support promoting their businesses, as well as more time to spend creating. Hero Heads allows you to 'wear your heart on your tee' with our unique, hand-drawn designs of inspirational heroes like Harriet Tubman, Rosie the Riveter, Malcolm X, and Abraham Lincoln. 10% of profit goes to a charity relevant to that hero (ex. President Lincoln's Cottage). All of our products are produced responsibly. Colin Bill, owner and founder, was initially inspired artistically to spread positivity through unique illustrations of people's heroes. Most of the designs of heroes featured come from customers' suggestions. Teluna began in 2014 with a simple idea: To create designs with the intent to help others. Founder and designer, Diana Johnson began working full time as a graphic designer back in 2014. After a year at a graphic design firm, her love of art, travel, and longing to make a difference inspired her to branch out on her own and build Teluna. "I wanted to find a way to use my design background to make a positive change. I wanted to give people a way to decorate their lives while helping to rebuild others and to teach the effect a creative lifestyle can have on an individual. The Teluna mission is to provide support to causes and communities around the world by bringing people closer to the issues through design. 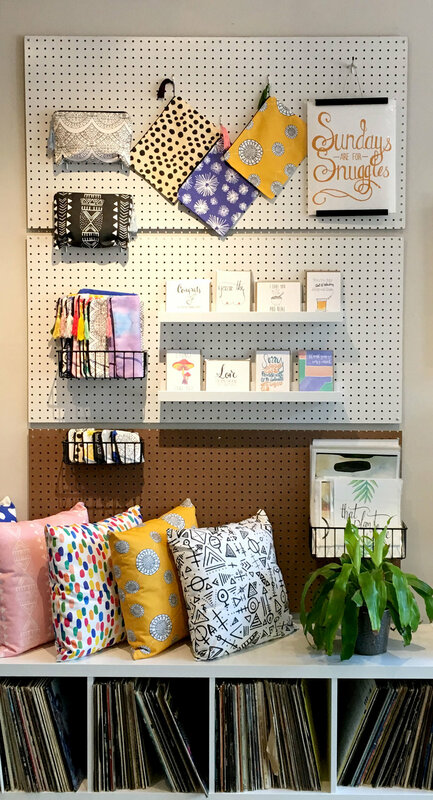 So with a big dream and a whole lot of art supplies, I started designing, cutting, sewing, and shipping handcrafted goods as a one-woman team. From the beginning, this mission would guide every Teluna decision. Every design is hand drawn or painted, printed responsibly in the USA then handcrafted in our east coast studio. While this process takes much longer, a lot more care and love goes into every piece. I'll continue to create designs so you may continue to decorate your life with a purpose. And by giving 5% from every purchase to a diverse range of causes, together we'll continue to rebuild lives and communities around the world. I believe in living The #TelunaLife: Impactful. Inspiring. Creative. Simple. To live a creative, simple life with a deep appreciation and love for helping others, inspiring the people around them, and having an impact on the world we live in. The Teluna Life illuminates happiness, fulfillment, and peace of mind." In my work, I find myself exploring a variety of colors and unique representations of a particular subject matter. My sometimes unrealistic color combinations are often inspired by a feeling or emotion, traditional color theory, or simply a trending color palette. As a finishing touch, you will almost always find dancing lines throughout the painting to create depth, texture, or a bit of added interest to draw the viewer in close. Creating is something I love to do and my inspiration is ever-changing. One day I'm painting jellyfish, the next…oysters, and the next…bold, vibrant florals. I strive to constantly redefine my art and grow through exploring maker movements on social media, collaborating with other creatives, and getting involved with local organizations. My definition of creative success is when someone hangs my work in their homes to compliment that perfect piece of furniture, add some vibrant color to a gallery wall, capture a memory, or represent something they love. I am currently in my 8th year of teaching middle school Art and can honestly say that my students inspire me every. single. day. My love for sharing art with others is why I am constantly exploring new concepts and looking for inspiration. My goal is to provide my young aspiring artists with the most relevant, engaging, and fun processes in the world of art-making.